An initiative proposed by five mayors last week, aimed at allowing cuts in pensions and retiree health care earned in the future, could put a spotlight on another growing problem: debt passed to future generations. The point of the drive led by San Jose Mayor Chuck Reed is to allow state and local governments to cut budget-threatening future retirement costs that are now apparently locked in by court rulings, while protecting pension amounts already earned. But the proposed state constitutional amendment, which faces a number of hurdles (see previous post), also requires a government agency with pensions or retiree health care less than 80 percent funded to prepare a plan to reach full funding in 15 years. Most pension funds try to get to full funding in 30 years. Shortening the period to 15 years would require larger annual payments, perhaps one way to dramatize the size of the debt and the urgency to begin paying it down. The initiative intended to give struggling government employers an optional tool to solve their retirement-cost problem, not a prescribed method, does not require that the plan to reach full funding in 15 years be put into effect. Retirement benefits, such as pensions and retiree health care, are regarded as part of pay. So if the cost of benefits are not fully paid while the worker is on the job, some would argue that a debt is unfairly passed to others who did not receive the services. Actuaries worry about reducing or avoiding “intergenerational” transfer of debt. Tightening its debt payment periods, the California Public Employees Retirement System decided in April to phase in a rate increase to get to full funding in 30 years. Much of the recent pension-funding debate has been about whether pension fund investment earnings forecasts used to offset or “discount” debt, now 7.5 percent a year for CalPERS, are too optimistic and conceal massive debt. And following legislation pushed by former Gov. Arnold Schwarzenegger, CalPERS has begun showing what happens to employer rates if investment earnings are 2 percentage points above or below the earnings forecast. 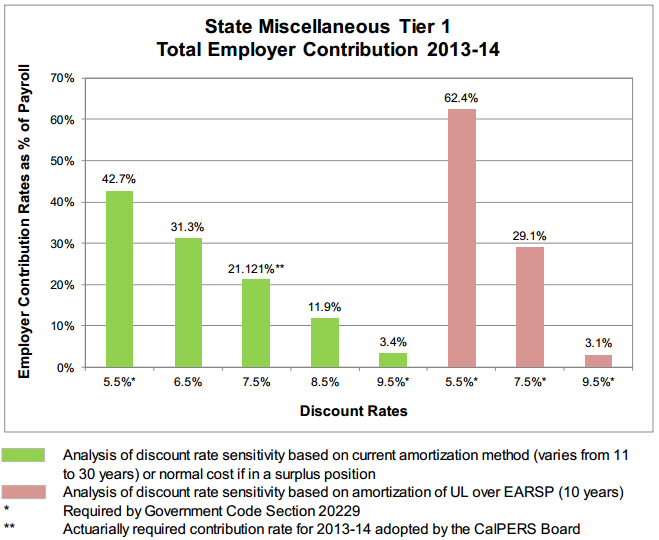 But like Reed’s proposed initiative, the legislation also directs CalPERS to show what happens to rates if pensions are fully funded in the “average remaining service period,” estimated at 10 years in a recent report. What is the impact, if any, of showing another way that retirement costs are being pushed into the future? A previous disclosure had mixed results. In a stark intergenerational transfer of debt, most government employers have pay-as-you-go retiree health care. No annual pension-like contributions are made to invest and help “prefund” the cost of retiree health care promised current workers. A government accounting change in 2004 directed employers to begin reporting retiree health care debt or “unfunded liability.” A CalPERS retiree health care investment fund created in 2007 now has $3.1 billion from about 350 local governments. Unlike those local governments, the state has not begun prefunding and last year spent $1.3 billion on retiree health care. Controller John Chiang estimates the state owes $64 billion for retiree health care promised current state workers over the next 30 years. It’s not clear whether passing debt to future generations will be added to the equity and fairness issues already facing public pensions. Private-sector pensions are being replaced by 401(k) individual investment plans that shift risk from the employer to the employee. Reform legislation giving lower public pensions to new hires, but not to current workers, means persons with the same job can get unequal pay. Stanley Druckenmiller, 60, a retired hedge fund founder said to be worth $2.9 billion, often was joined by Geoffrey Canada of the Harlem’s Children Zone in appearances at Stanford, Berkeley, USC and other campuses. The two are said to be convinced that only a mass youth movement, similar to opposition to the Vietnam war, can “break through the web of special interests” and force politicians to enact reforms. “With graph after graph, they show how government spending, investments, entitlements and poverty alleviation have overwhelmingly benefited the elderly since the 1960s and how the situation will only get worse as our over-65 population soars 100 percent between now and 2050, while the working population that will have to support them — ages 18 to 64 — will grow by 17 percent,” Thomas L. Friedman wrote in the Times. Friedman and James Freeman in the Journal did not say that Druckenmiller mentions public pensions in talks about “all the cans we’re kicking down the road.” But pension issues seem likely to be included if there is a movement for generational fairness. In a request for a title and summary for the initiative last week, Reed was joined by mayors Miguel Pulido of Santa Ana, Tom Tait of Anaheim, Pat Morris of San Bernardino and Bill Kampe of Pacific Grove — all Democrats except Tait, a Republican. “As mayors of California cities, we have seen firsthand how the rising cost of public employee retirement benefits has forced cities, counties and other government agencies to cut public services, layoff hard-working employees and defer badly needed improvements to critical infrastructure,” the mayors said in a letter last week. State court rulings are widely believed to mean that retirement benefits offered on the date of hire become “vested rights,” protected by contract law, that cannot be cut unless offset by a new benefit of equal value. The initiative (see website) is a constitutional amendment intended to “clarify” the law and allow cuts in retirement benefits earned by current workers in the future, while protecting benefits already earned through time on the job. The mayors need a not unfavorable title and summary from Attorney General Kamala Harris, money to gather signatures to place the initiative on the ballot and a campaign for voter support. A coalition of well-funded public employee unions (see website), which has already conducted polling on the issue, contends that the initiative breaks promises to workers and that retirement system issues should be handled through negotiations. If the initiative makes the ballot, passes and survives legal challenges, pensions or retiree health care plans less than 80 percent funded would have to prepare a plan for full funding in 15 years with specific steps, such as lower benefits or higher contributions. After a review period, a hearing would get public response before the plan is formally adopted. Then this process — plan preparation, public hearing, formal adoption — would be repeated each year until the pension or retiree health care plan is 100 percent funded. This entry was posted on October 21, 2013 at 7:19 am and is filed under Initiative, Reforms. You can follow any responses to this entry through the RSS 2.0 feed. You can skip to the end and leave a response. Pinging is currently not allowed. It AIN’T just the mayors that are seeing first hand the destruction these obscene benefits are doing to cities, counties, and special districts (and what the pensions are about to do to school districts). What is so very troubling are the continued increase in employee perks without the required funding. That includes CalPERS, Calstrs, and the County plans. And, I’ll say, it wouldn’t have come to this if the pension systems were independent of union influence and the pension agencies were independent. I’m not sure why, or who, allowed for the complete takeover of the program but the generosity of the pension boards to their own members, at the expense of the taxpayers at every turn, is disgusting and should be criminal. – Every single time I hear a politician say “we need to handle this at the bargaining table” I instantly know their campaigns have been funded by the public employee unions and their vote has already been bought. I’ve seen it play out time after time. – No surprise here. But Bille says, from a post on last week’s Calpensions : Calpers is just an investor. Nothing could further from truth. The funding for the CalPERS legal challenge, as well as the CalPERS advocacy of many issues that have negatively impacted cities, counties, special districts, taxpayers (including SB 400, their bullying of bankrupt cities like Vallejo, Stockton, and San Bernardino) come from tax payer funds meant to pay for employee pensions. Instead, tens of millions of dollars, or maybe hundreds of millions of dollars, have been DIVERTED to the CalPERS General Fund … In other words, CalPERS is using our money to fight against the very reforms we want.… and then they charge us more to cover the expense. As long as California has Taxpayers CalPERS has an endless revenue source (in their opinion unless we fight back). As a CalPERS customer, I would like to cancel my unsubscribed subscription to your lousy service!!! Should read: As a CalPERS customer, I would like to cancel my unsubscribed subscription to their (Calpers) lousy service!!! Ed, I read Stanley Druckenmiller’s WJS article and while the generation imbalance between the CURRENT and FOLLOWING generations is real, the current generation, at least with respect to Social Security is not the greedy players he makes them out to be. It’s easy to demonstrate (especially for those making near the maximum wage base) that they effectively get back in SS benefits their own contributions with a VERY modest rate of return. The root cause of the problem that their contributions are not being saved and invested but spent, and now a much smaller population (following these baby boomers) is in line to make it up. While that’s not fair to the next generation, the baby boomers aren’t as greedy as presented. Aside form going after the politicians that spent this money (silly of course) a “fairer” but politically unacceptable solution might be to try to recover money from those who have actually received (and continue to receive) much MORE than they contributed … older retirees. I didn’t see Mr. Druckenmiller recommending that the US Gov’t should have first dibs on the estates of deceased retirees to the extent they received more that their own SS contributions with a modest rate of return. (2) While Mr. Druckenmiller complains of intergenerational unfairness in SS benefits, why does he not even bring up the MUCH MUCH greater unfairness in the extraordinarily generous taxpayer-funded pensions and benefits granted virtually ALL Public Sector workers. It’s been pointed out that Public Sector workers (which represent only 15-20% of all workers) will get back more in total retirement dollars than the Social Security benefits paid to ALL Private Sector taxpayers (representing 80-85% of the workforce). (2) A bit of self reflection might have also been appropriate for Mr. Druckenmiller. As a hedge fund manager he benefited enormously (perhaps to the tune of $1 Billion out of his $2,9 Billion) by paying capital gains tax rates (instead of the MUCH higher ordinary income tax rates) on almost all of his income due to perhaps the most abusive loophole in the US Tax Law …. allowing his income (the “20% or so of all “profits” that he make for his clients) to be considered “carried income” for tax purposes and taxed at the much lower Capital Gains rates. I didn’t see Mr. Druckenmiller offering to re-calculate his taxes using the ordinary Income tax rates and pay it back. All very true, but CalPERS above statement should rightfully have included the following ……..
What is so twisted on the analysis is this is how Social Security works…the young pay for the old and it passes from generation to generation, and it works. What “they” will try to do, which is what the powers that be are trying to do with the Post Office, is show it cannot support itself — although with the Post Office, the ones trying to privatize it have demanded it calculate funding its benefits 75 years in the future, which no company has ever been required to do, and this is why it is showing a deficit, when, in fact, it is sustaining and making money if that calculation is not put in the mix — funding for unborn potential employees. This is just a ruse so Corporate Welfare can steal pensions from cops, firefighters, teachers, scientists, and those people that choose a career in public service. SAN JOSE’S PUBLIC PENSION COLA-THEFT WILL NOT STAND. Support public pension contractual rights in the USA. Contribute at saveperacola.com. “Friend” Save Pera Cola on Facebook! Al, I could take a nice vacation if I had $1 for each time you cut-and-pasted that crap. Young people have been transferring funds to the older through health insurance since the concept of health insurance began… the implied subsidy. You pay a rate while you are 20-50 years old that is far higher than the costs of your age pool. That is not a public benefit issue… all health insurance does that. The travesty is (for *everyone*) that the insurance industry is free to cancel your insurance at any time for any reason or no reason, even if you have paid in for 30 years and not used a dime of benefits. Perhaps one of the biggest pure-profit maneuvers of the health insurance industry. As for future pension accrual of existing employees, obviously it must be reduced; the existing rate of accrual was far beyond reasonable actuarial practice. spension, you say that my premium would be lower if I were not paying for older insureds who use more services than I do? Why that sounds like really bad Socialism cloaked in Capitalism. It does not sound very efficient either if I am also paying the health care cost of people with insurance and those without insurance who show up in expensive emergency rooms to be treated by law (notice Ted Cruz didn’t fight to repeal that) for an infection. A better way would be to have everyone pay something and get less expensive treatment in a routine visit. But on topic, I guess the point Ed is making here is that everyone should pre-fund a health account to pay their insurance premiums prior to retirement. That way, I won’t continue to see the Medicare Tax withholding on my check. Bille… insurance is most definitely socialism. All insurance. Everybody pays a little but a few get big payouts… I think people tend to like it if the payout is due to an event beyond anyone’s control, like lightning striking and destroying your house, even if you had a lightning rod deployed. On the other hand, there is a lot of cost in sorting out the exploiters and the responsible parties, relative to just paying everyone. Long ago no-fault car insurance was touted, where most of the administrative cost was just to make reject fraud. Otherwise, just pay out for true damage and collisions. Turns out it is cheaper than apportioning fault. But Americans hate the concept, we want to apportion fault and blame. As for health insurance, the implied subsidy of older folks was always there. And you people don’t like charging those with truly random maladies (say, a rare genetic disorder) huge extra costs. They lost the lottery, we all kind of like paying them. Well, random maladies are more frequent in an older population, and the young subsidize that, and always have.